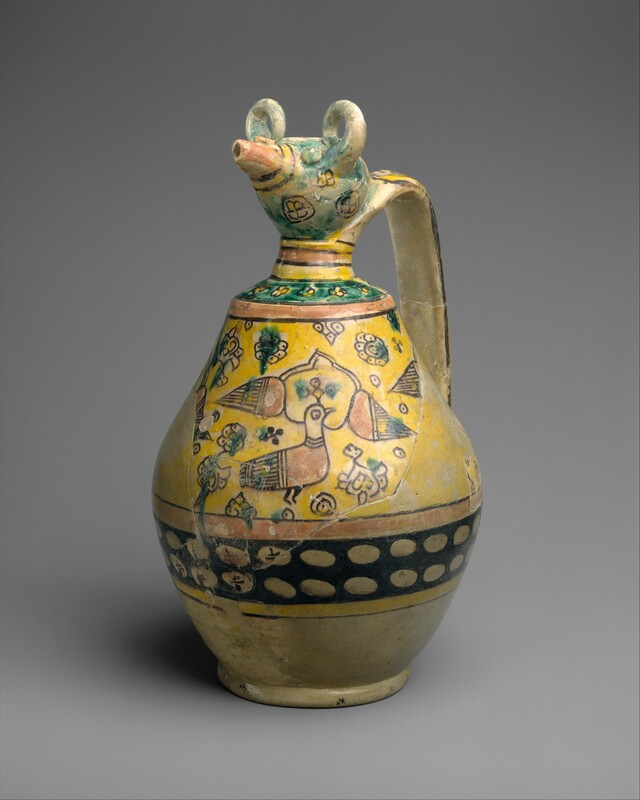 Islamic art, with all of its richness, precise geometry of line, and saturated colors, is united in its origins, but diverse in its applications. Both the time range and geography for its expression is vast, but there are threads that tie together the types of its visual arts. What is Islamic art? If you visit a museum wing, you’ll be surrounded by objects of great beauty from both daily life and royal courts, as well as those directly related to the Muslim faith. The genre spans more than 1400 years, dating back to the time of the prophet Mohammad. Since the 7th century, the strict definition of what determines Islamic art has broadened. It’s not only religious art – the term covers art from all the Islamic cultures, as well. We can thank the art historians for coming up with the category – but it’s still a wide-reaching one. Today, we can appreciate the influence in everything from architecture to calligraphy, pottery to woven carpets, painting to metalwork. It’s moved into the modern age, but still retains distinct elements that have distinguished it from the outset. A common belief about this type of art is that it doesn’t allow the depiction of the human or animal form, allowing only patterns and calligraphy for expression. 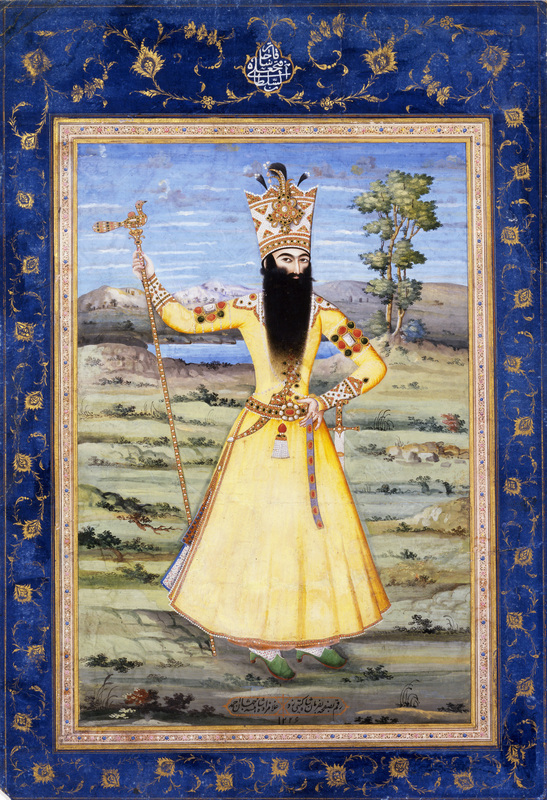 However, the secular world will provide examples of these types of figures throughout all eras of Islamic Art. You will find, perhaps, that there is much more to this genre than you ever thought. 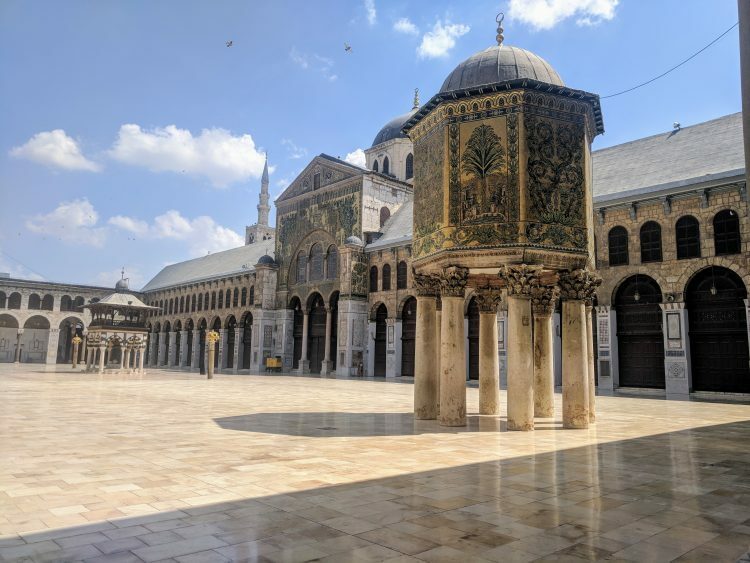 We can just brush the surface of the many examples of what you’ll encounter as you broaden your appreciation of Islamic Art, and we’ll cover an incredible amount of territory from the site architectural wonders in places like Syria, Spain, and elsewhere. Overwhelmed, yet? Let’s start at the beginning. 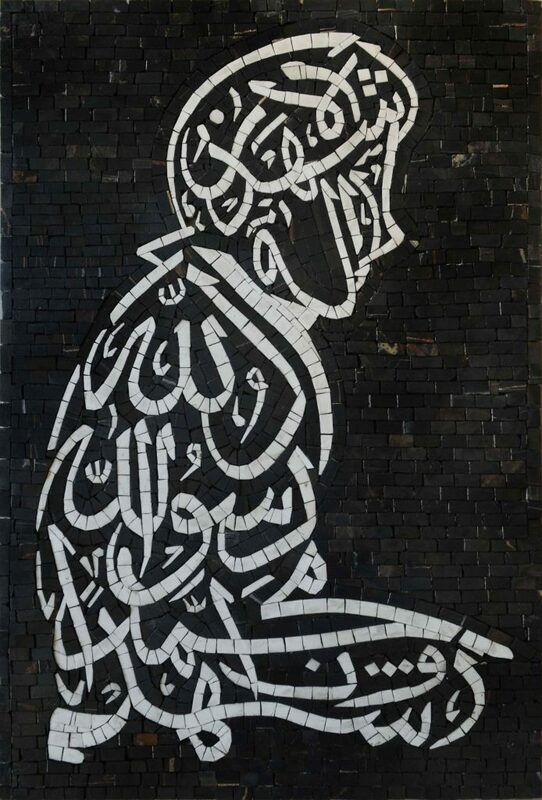 Some of the earliest examples of Islamic Art are seen in calligraphy work. Indeed, calligraphy is one of the first things you might think of when you consider Arabic artwork. It’s fascinating to see how this art form has evolved from the styles used in the earliest times of the Islamic Empire. 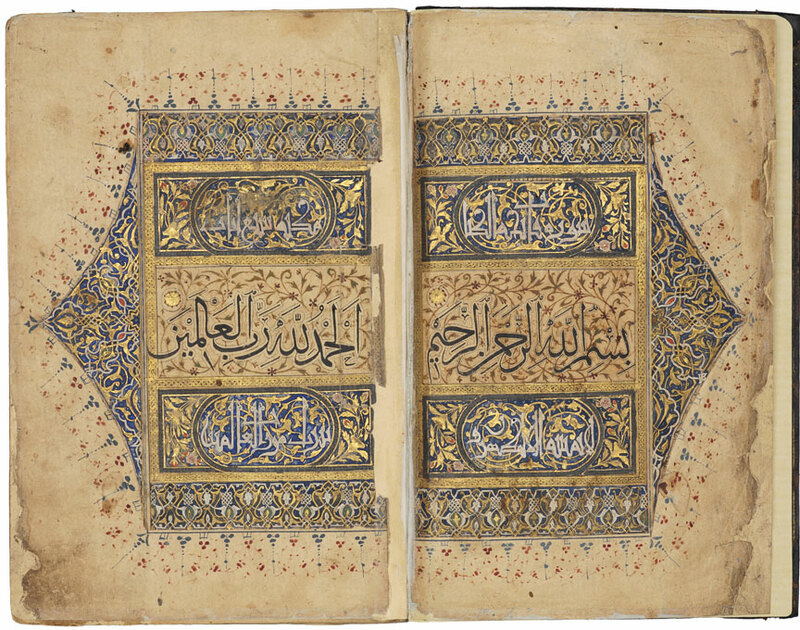 Calligraphy was essential for transcribing the word of God and in creating sacred Qur’ans. The earliest style of script was Kufic – when you look at the style of lettering, you can see how it evolved from writing on stone. It’s angular, and it wouldn’t flow with pen strokes. Styles changed through the centuries, becoming more ornate. As you’ll soon see, scripts continued to evolve into the swirling forms you’ll encounter even today. Woven textiles, functional pottery, and metalwork at the beginning of the period were influenced by existing Syrian techniques – silver and bronze serving ware were popular with affluent households, and glass and pottery often featured animal or nature motifs. Our enjoyment of whimsical animal forms is something that has remained constant through history. The 8th century saw the Abbasids take control of the Islamic Empire. The capital moved to Persia, and the “Golden Age” began – three centuries of flourishing sciences and the arts. 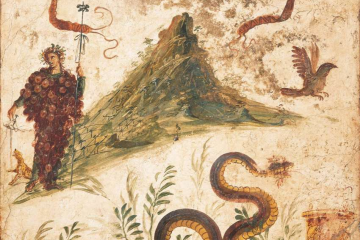 Mathematics, literature, philosophy, the natural sciences and the arts were all thriving. 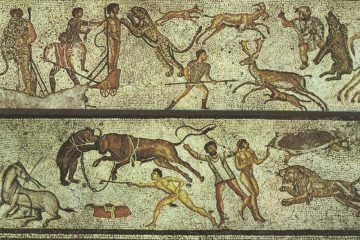 The contact with Greco-Roman, Byzantine, Persian, and Indian empires was all inspirational for the advancement of arts and science. A distinctive style developed in Islamic Art, and it spread – widely. Showcasing some of the fine examples today involve quite a bit of virtual globe-trotting. Miniaturist paintings are a highlight of Arabic art. As we mentioned, the secular world had a broad pool of figurative art, and these provide incredible examples. These small pieces were intended for books, and their illustrative qualities and sometimes fantastic subjects can be both curious and beautiful. Wealthy buyers made the use of luxurious pigments such as lapis lazuli possible. Shown here is a depiction of Fath Ali Shah Qajar. Islamic ornamentation excelled with its depictions of the natural world. This 17th-century Persian piece by Riza-yi `Abbasi combines delicate brushwork in the tree branches that recalls the flowing calligraphic script of the period. 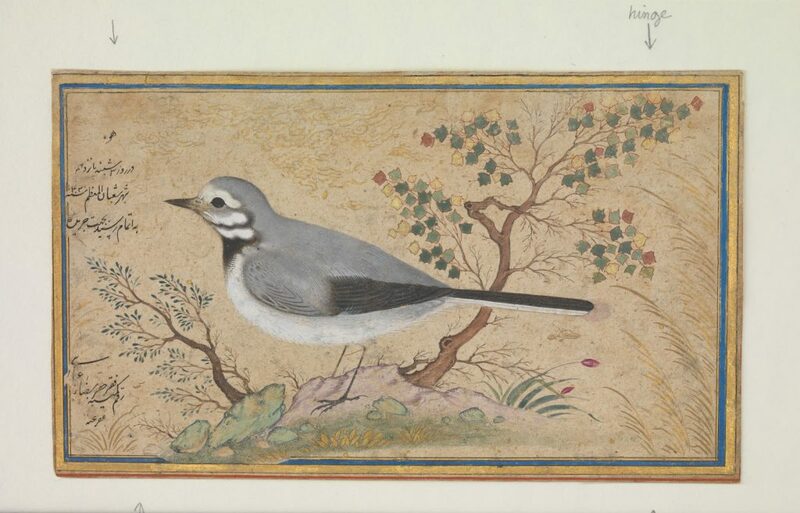 The nightingale is rendered in ink, watercolor, gold, and silver. Geometric patterns are integral to Muslim art throughout its history. They represent the infinite nature of Allah, celebrate the language of the universe, and provide a means for thoughtful meditation on our place in life and creation. They’re a distinctive component of the genre. Natural elements can include stylized depictions of flowers and plants. 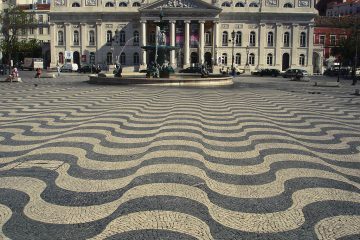 Riveting examples of these patterns can be seen in tiles and mosaic work used in architecture. The Dome of the Rock religious monument in Jerusalem does not utilize any human or animal figures in its decoration, yielding some incredible use of this sort of ornamentation. Another iconic example of the melding of Islamic art and architecture exists today at the Umayyad Mosque in Damascus. Completed in the 8th century, its influence has been decisive. From the minarets to the mosaic work, later mosques still bear the echo of the archetypal architecture. The ground plan from the mosque was copied in subsequent centuries. As an example, the Great Mosque of Córdoba was directly inspired by the Umayyad Mosque. 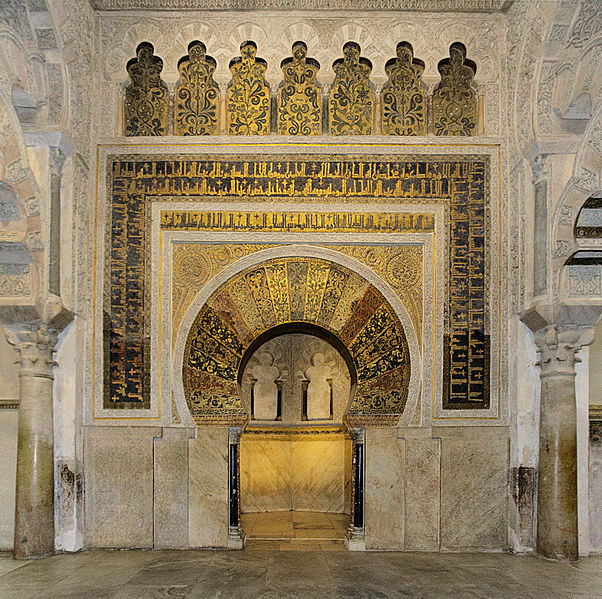 Built in Andalusia, Spain, it features grand arches and an ornate mihrab, or prayer niche. Again, the mosaic and tile work is superb. The use of Quranic inscriptions around the mosque’s walls reference the Islamic adherence to not depicting figures in the holy space, instead using tilework and architectural forms as decoration. The timelessness of this approach to mosaic tile is still appreciated in the 21st century. Beauty and practicality met luxury in many of the most recognizable pieces of Islamic art history. Woven rugs and fabrics have a strong association with the culture. Fun fact: words like cotton, muslin, taffeta, and damask all have origins in the fabric trade of the Islamic Empire. Good fabric was valued like currency. Although there are few examples of early fabrics still in existence, there are still fine examples of other woven art like rugs and tapestries. Prayer rugs show fine use of the repeating geometric and floral motifs that we’ve seen in tile work and other forms of Islamic wall art. Weavers of the Ottoman Court produced stylized patterns in the popular “Saz” style. The 16th- century workshops had a set catalog of designs that were used. Patterns in the Saz, floral and “cintamani” styles were repurposed for other decorative art like ceramics, bookbindings, and illuminated manuscripts. 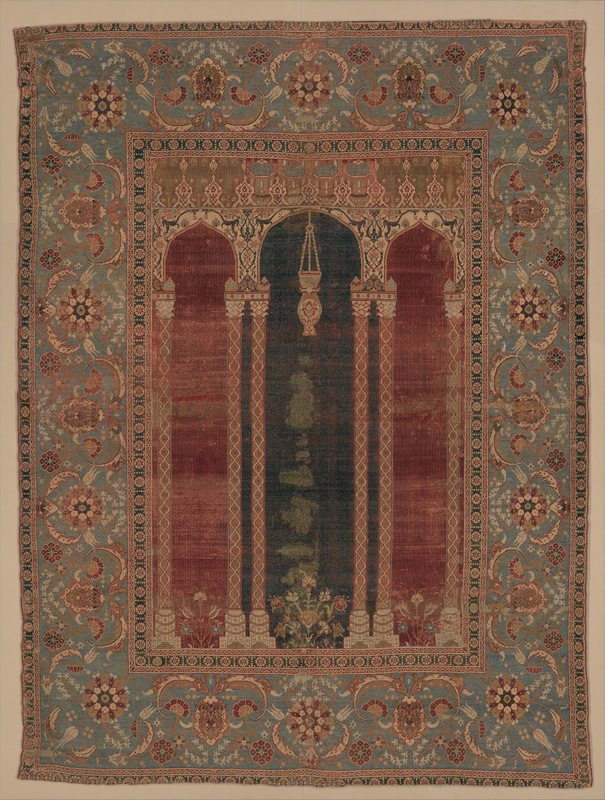 Exquisite examples of prayer rugs still exist, like this Turkish rug from the 16th century. Intricately woven from a blend of silk, cotton, and wool, it features both geometric patterns and floral motifs. The center design is one of the first known pieces to feature the triple arches. 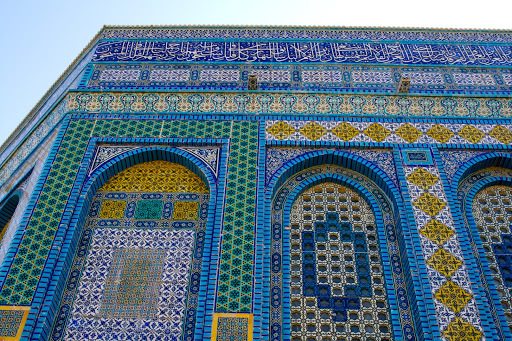 The Islamic world is renowned for its incredible tilework: vivid, saturated colors adorn ceramic tiles that feature an almost infinite array of geometric patterns. 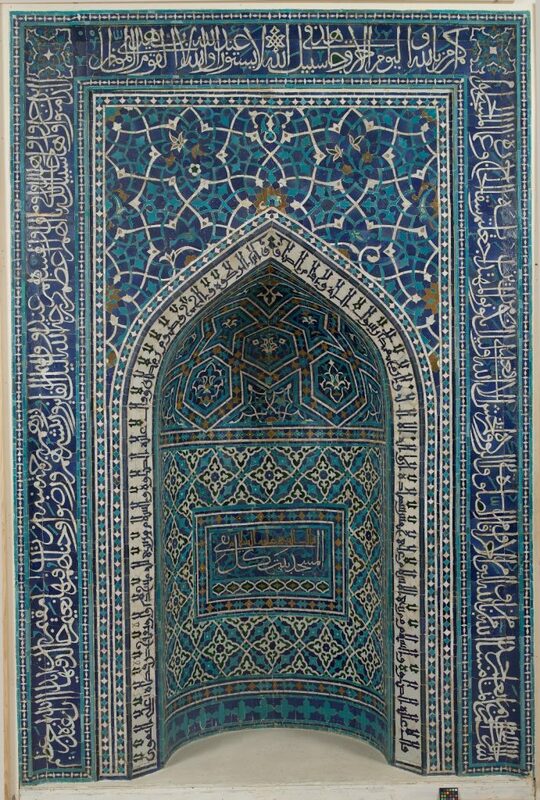 This tilework has adorned the walls of mosques, tombs, and the homes of the wealthy, enhancing the beauty of these spaces, for centuries. The intricacy and quality of these wall installations transcend time. This fine example is from the 14th century. Trade with other cultures and countries expanded the notion of what could be achieved in ceramics and tile decoration. Not only did artists begin to experiment with new glazes and techniques, they added new motifs to their decorative pieces. 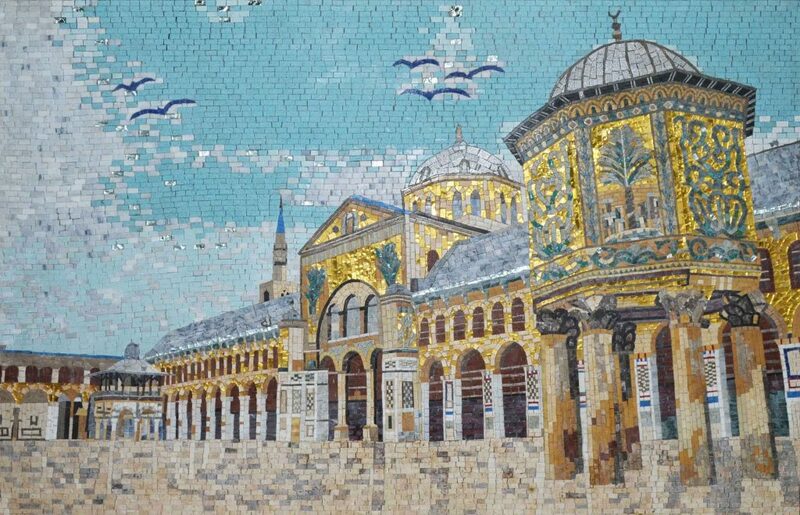 Tile mosaics utilized the durability and intense colors of the ceramic tiles to create detailed works of art. 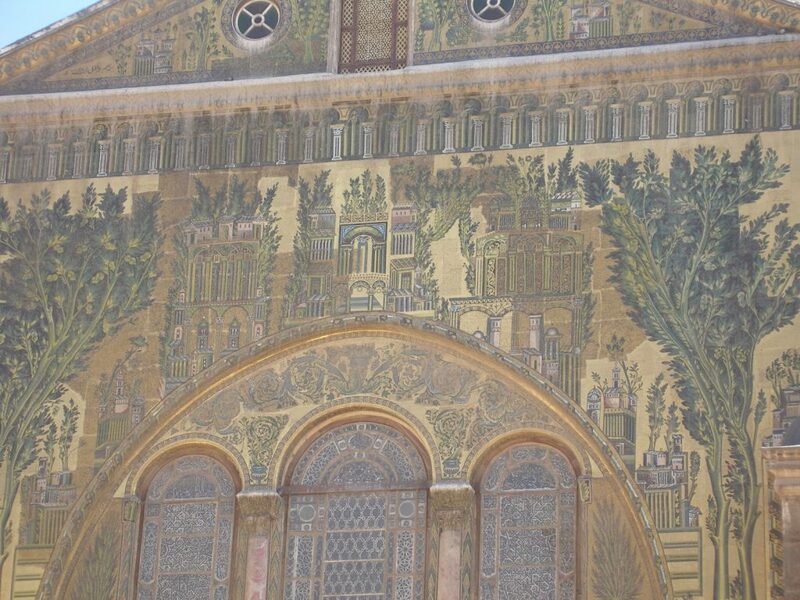 This example is from the Umayyad Mosque in Damascus. 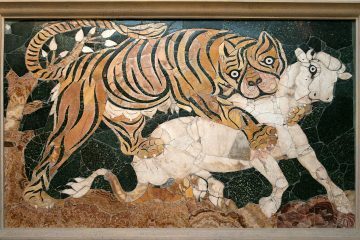 Unlike more ephemeral artworks such as paintings or tapestries, tile mosaics were able to withstand the rigors of exterior exposure. This made the intricate works ideal for building walls and courtyards. Today, even more intense colors and improved setting techniques have ushered in a new age of artistic expression with mosaic. 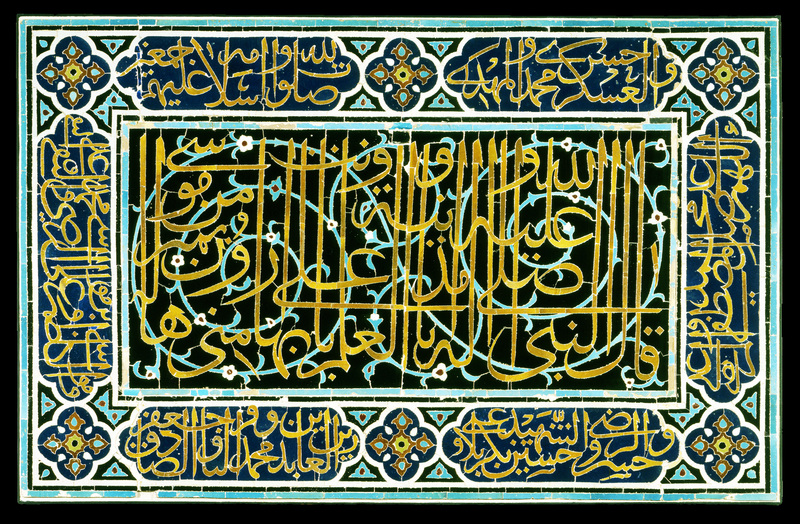 Tracing the evolution of Islamic calligraphic art is so profound that scholars dedicate themselves to the study. 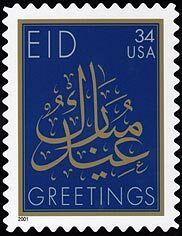 Today, the layperson can appreciate the beauty and form of Arabic calligraphy in its historically religious application, as well as its use in secular forms. As Arabic scripts changed, they were perfected and employed in works of art. Throughout Islamic culture, calligraphers were highly regarded as true artists, with years of apprenticeship and training necessary to perfect their skills. Calligraphy as an art form can sometimes be more about creativity than legibility. 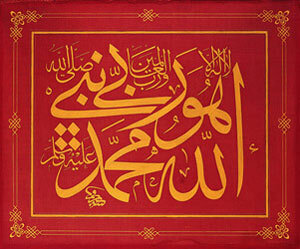 Throughout history, educated people could read the Arabic writing used in Islamic calligraphic art. However, some examples of calligraphy are so ornate that creativity was clearly favored over legibility. Calligraphy was, and is, appreciated above all for its aesthetic qualities and the skill of the calligrapher. The message and the subject are sometimes so entwined that they cannot exist independently. 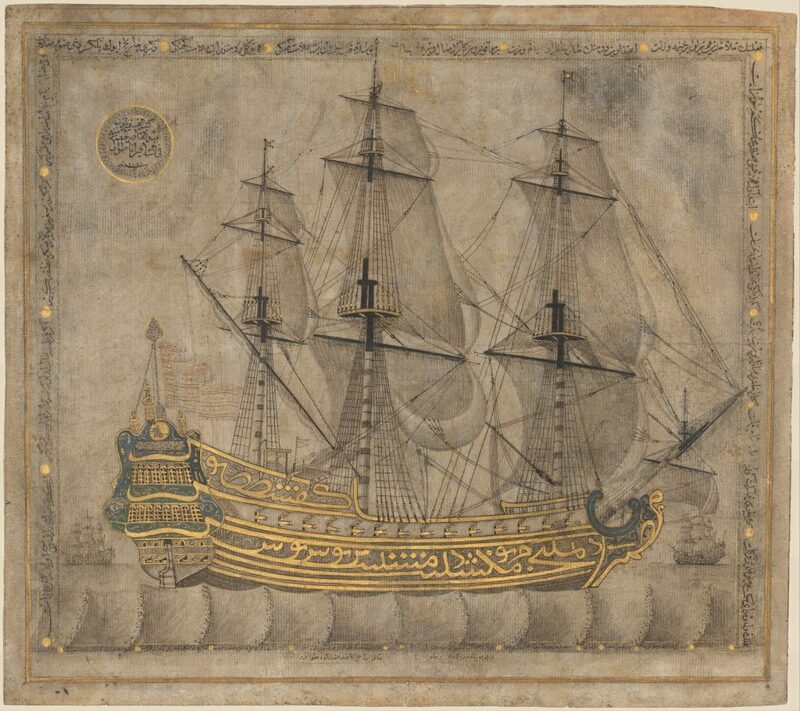 Calligraphic drawings are important pieces of Muslim art history. 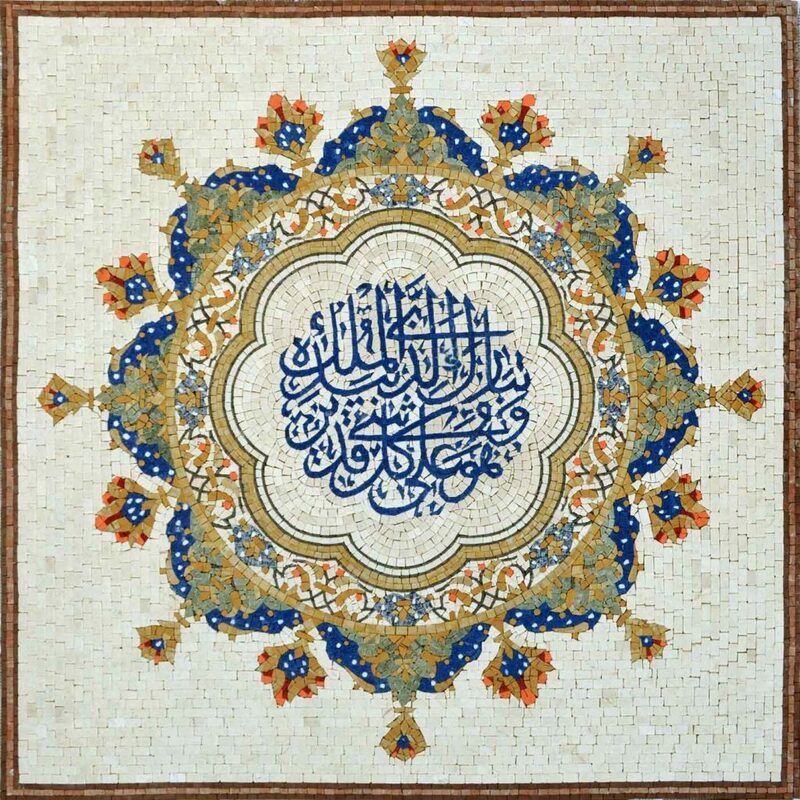 Ottoman artists were expert at portraying a religious message through the use of a calligraphic inscription woven into a piece of figurative art. An entire story of faith and metaphor exists in this piece, which references the Seven Sleepers of Ephesus passage from the Qur’an. Islamic Art is complex, rather broadly defined, and steps nimbly between secular use and the ornamentation of religious structures. Some decorative features developed in response to the agreement not to use human or animal figures in a place of worship, leading to a recognizable signature in pieces as varied as rugs, ceramics, and paintings. The distinct look of Arabic calligraphy was – and is – a highly regarded art form, still changing and evolving with modern artists. We can thank Muslim tile artisans for introducing the world to the mysteries of geometry and the intimate contemplation of the infinite that their patterns evoke. All of these components evoke the genre. We hope you’ve enjoyed this brief introduction into the world of Islamic Art and its rich history.